The DP, “the Democratic Party”, will stand up with farsight for the future of our commune, should you, dear fellow citizens, place your confidence in us during the elections on 8th October 2017. 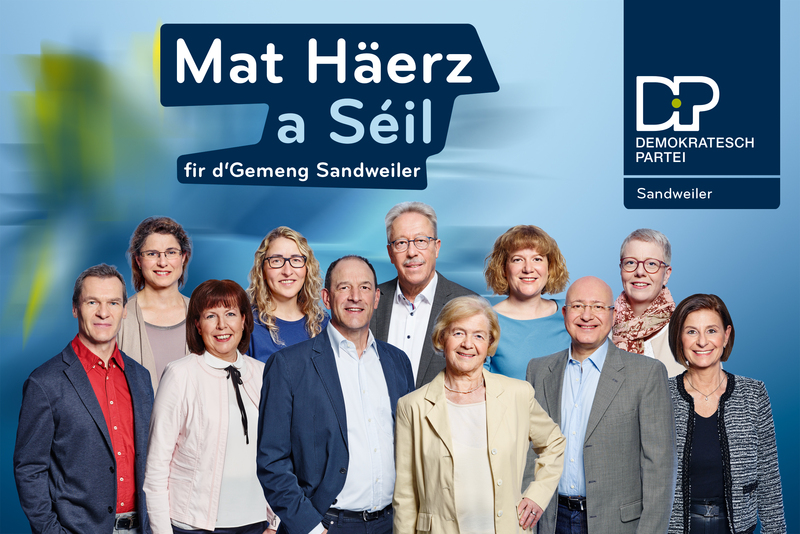 The three guiding principles of the municipal electoral programme of the DP Sandweiler – living, transport, children – are more than ever of immediate interest. The commune of Sandweiler has a big development potential, which should in the future be finally and effectively developed in the interest of its population. - Due to its proximity to the airport, our municipality has a special responsibility for the local, regional and national economic development. The airport with its many companies is de facto the biggest employer in the country. - The proximity to Luxembourg City is also significant. On the one hand, these circumstances have a positive influence on our commune, but on the other hand, they represent a major challenge for local government officials. A farsighted plan on municipal level provides the basis for a healthy commune. The top priority of the DP Sandweiler consists of analysing the current state of the municipality. The most important task is to revise the general building plan (PAG) and the communal development plan (PDC). The available plans are over 20 years old and hence not up-to-date. Planning the new PAG needs to be discussed in advance with all citizens, not least to avoid long and costly legal proceedings. The DP Sandweiler would like to point out that our municipality is one of the smallest (772 hectares) in Luxembourg. Why can the present community leaders not make suitable plans for our municipality? The best example for this lack of planning is the sewer which has almost never been adapted to the newly erected residential areas. The consequences are obvious: in case of abundant rainfall, certain residential areas have had problems lately with flooding on a regular basis. We envisage to engage an independent expert to review the sewer system in order to find an objective solution for the problem. Furthermore, measures to improve road and traffic safety have not been consistently put into practice. For example: Nothing has been done for the safety of the employees of Cargolux and the companies in the industrial estate “im Rolach”, so that they can get safely to work by either public transport or by foot, even though the local council unanimously supported these measures. The same applies to the “rue de la Vallée”. Why are not more roads adapted for disabled people? The DP wants to discuss shared spaces for the centre of Sandweiler. It is important that the municipality exchanges its views in a clear and precise way with governmental bodies. Have meeting places for everybody been set up or has something been done to improve the quality of life in Sandweiler? Has the current local government done something for community life? Something needs to happen regarding transport – for Sandweiler’s citizens and businesses. There are many ways to improve mobility: new bike paths, footpaths, and bus stops, or a communal bus service. To analyse the situation in its totality, the DP wants to commission a mobility study. The DP speaks out against long-term parking of non-local residents and favours vignettes for residents. Schools and childcare are a major concern to the DP Sandweiler. For the DP, it is illogical that a second school should be built at a different location. The current majority government (CSV/LSAP) has still not expressed why such a construction in the residential area “in den Jéchtstecker” would be justified. Moreover, this residential area would not be able to cope with the additional volume of traffic. According to calculations, 400 additional car movements could be expected per day. Why do we need a new school, when no new residential areas have been authorised in Sandweiler for years and consequently not more children will go to school in our municipality in the near future? The DP wants to know all the facts, before a new school is built. In case additional school infrastructure should be required, the DP will – as it used to – favour expanding the present school grounds “um Weier”. Another question which is on our minds: Why are €2,600,000 of the municipal budget intended for the renovation of the town hall? We find this completely unnecessary.